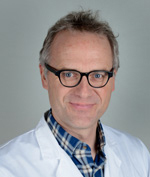 Head of the Department of Cardiology in the region of Rheintal Werdenberg Sarganserland. Jens P. Hellermann studied medicine in Mainz and was trained in internal medicine and cardiology at the University Hospital of Zurich. Following a stay at the clinical epidemiology department of Mayo Clinic from 2000 to 2002, he returned to the University Hospital of Zurich in 2003 to serve as deputy senior physician and then as senior physician at the Clinic of Cardiology. As a guide for scientific studies and dissertations he was able to utilise in Zurich the knowledge he had gained at the Mayo Clinic, and acquired his license to teach at university (Habilitation) at the University of Zurich in 2005. The same year he was appointed head of the department of cardiology in the hospitals of Rheintal (Altstätten, Grabs and Walenstadt). In 2006 the regional cardiology team was awarded the ALTANA research prize for an epidemiological study on the prevalence of severe heart failure in the Rheintal region. Since January 2015 Jens Hellermann is chairman of Internal Medicine at the Hospital Schiers (GR).